At least 200 million girls and women in the world have suffered some form of genital mutilation according to the UN, and 68 million are still at risk. On the International Day of Zero Tolerance for Female Genital Mutilation, Socialists and Democrats in the European Parliament re-stated their strong commitment to eradicate this aberration. S&D MEP Pier Antonio Panzeri, in cooperation with the NGO No Peace Without Justice (NPWJ), has organised an event with prominent African women who fight against FGM. Their coalition for action against FGM is reflected in a photographic exhibition  and web-documentary presented today in the European Parliament. “We render public recognition to the courage of so many African women who have formed coalitions to fight against the cruelty of FGM. In the Parliament we want to give voice to those brave women who witness their experience of pain, but also their story determined rebellion against the patriarchal logic of FGM that violates the dignity of women,” said Pier Antonio Panzeri. Un ponte tra Roma, Parigi e Tunisi, per mobilitare la società civile per l'integrazione e la pace, ponendo al centro il ruolo strategico dell'Europa del Sud. È questo il senso di "Sinergie per la Pace", incontro su iniziativa del Rotary Club Roma Sud che si é svolto a Palazzo Giustiniani a Roma. Al dibattito hanno partecipato Emma Bonino come fondatrice della ong "No peace without justice", il Premio Nobel per la Pace 2015 Abdelaziz Essid, il Sindaco di Mazara del Vallo Nicola Cristaldi, e il fondatore e presidente dell'associazione Rondine Cittadella della Pace Franco Vaccari. Cade oggi la Giornata mondiale contro le mutilazioni genitali femminili e una delle più note testimonial contro questa vera e propria violazione dei diritti umani, Nice Nailantei Leng’ete – operatrice di Amref Health Africa, scelta dal Time nel 2018 tra le 100 persone più influenti al mondo sarà a Milano, Bruxelles e Roma. Nice è in Italia e al Parlamento Europeo per raccontare la sua storia, lanciare un appello contro l’indifferenza e per un mondo che abbia fiducia nell’Africa. In occasione della Giornata Mondiale “Tolleranza Zero su Mutilazioni Genitali Femminili”, Nice e’ stata ospite presso il Parlamento Europeo, a Bruxelles. L’evento cui Nice ha preso parte è organizzato da Non c’è Pace senza giustizia, Differenza Donna, l’Istituto de Santé Génésique/Women Safe (Francia) e La Palabre (Belgio), in cooperazione con MEP Pier Antonio Panzeri (Presidente del SubComitato sui Diritti Umani del Parlamento Europeo). La tavola rotonda è organizzata come parte del progetto BEFORE. L’evento sarà preceduto dal vernissage della mostra “UNCUT: The revolution of women against MGF” (foto di Simona Ghizzoni e Testi di Emanuela Zuccalà). Riferimento Regionale per le MGF. L’evento è parte del progetto “Mutilazioni Genitali Femminili: azioni di contrasto e percorsi formativi tra Africa e Italia” sostenuto dall’Otto per Mille della Chiesa Valdese. The American Society of International Law (ASIL), No Peace Without Justice and the Yemen Peace Project co-hosted a Jan. 15 program titled “Peninsular Perspective: Human Rights and Accountability in the UAE and the Region” at ASIL’s Washington, DC’s headquarters. Durham University Ph.D. candidate Matthew Hedges held the audience spellbound with his moving narrative on his six months’ detention in the UAE on charges of espionage following a two-week trip last year to conduct interviews for his Ph.D. thesis. “I was held nearly entirely in solitary confinement and coerced into confessing to the charges levied against me,” Hedges explained. The academic was researching the UAE’s foreign and domestic security policy after the Arab Spring, focusing on two parallel processes: the concentration of power among tribal elites and the stratospheric rise of the UAE security services. In a five-minute hearing on Nov. 21 last year, he was sentenced to life imprisonment. Five days later, following the British government’s intervention, he was released and deported. Former Ivorian President Laurent Gbagbo has been acquitted of all charges of crimes against humanity at the International Criminal Court. The first sitting president to be transferred to The Hague. He’s been there since 2011 on the accusation that he incited the 2010 post-election violence in the Ivory Coast after he lost an election run-off. After over 8 years in The Hague, ICC judges have thrown out the case against Laurent Gbagbo even before the end of the trial. It’s another massive blow for the ICC prosecutor – the case against Kenyan President Kenyatta was dropped and former DRC vice president Jean-Pierre Bemba had his conviction overturned. And this acquittal is another embarrassment. NGOs call on Bahraini authorities to drop all charges and ensure the immediate and unconditional release of Sheikh Ali Salman, Secretary-General of Bahrain's largest political opposition society, al-Wefaq National Islamic Society. We the undersigned call on Bahraini authorities to drop all charges and ensure the immediate and unconditional release of Sheikh Ali Salman, Secretary-General of Bahrain's largest political opposition society, al-Wefaq National Islamic Society, who has been serving a four-year prison sentence for charges in response to political speeches he delivered in 2014, and who is now facing a potential death sentence in a groundless new trial on politically motivated charges. An alleged chemical weapons attack against civilians in Douma, Syria has been condemned widely by civil society. The attack is said to have killed at least 60 people and left over 1,000 injured. An open letter published this week, signed by 15 NGOs including Coalition members REDRESS, No Peace Without Justice, the International Federation for Human Rights (FIDH), TRIAL International, Open Society Justice Initiative and Coalition parent organziation the World Federalist Movement, calls upon the EU and UN to ensure accountability for crimes committed during the conflict at the “Brussels II Conference” on the 24th April, and to prioritise overcoming the challenges in meeting humanitarian needs. Un atelier d’information et de plaidoyer sur la problématique des Mutilations génitales féminines (MGF) à l’intention des Forces de défense et de sécurité (FDS) s’est ouvert à Ouagadougou, ce lundi 26 février 2018. Le présent atelier, organisé par l’ONG Voix de femmes, en collaboration avec «No Peace Without Justice» constitue l’une des dernières activités du projet Ban MGF et s’inscrit dans la dynamique de mobilisation des acteurs nationaux contre la pratique des MGF. Pour la présidente de Voix de femmes, il s’agit de bénéficier de l’implication plus grande et soutenue des FDS pour l’accélération de l’élimination des MGF. The Gambia Committee on Traditional Practices -Gamcotrap- and No Peace Without Justice last Wednesday celebrated the International Zero tolerance day onto end Female Genital Mutilation –FGM- on the theme “Accelerate Zero Tolerance to end FGM by 2030. Over the years, Gamcotrap has taken the lead in celebrating zero tolerance to end FGM in The Gambia working with all sectors across the country. The international day of zero tolerance on FGM is a global event adopted by the United Nations sub-commission on human rights. Speaking at the event hosted at the Friendship hostel at the independence Stadium in Bakau, American Ambassador Patricia Aslup said as the day is celebrated, people must know that zero tolerance means exactly that zero tolerance is placed on an act of violence against women that neither has religious basis nor relevance in modern culture. “We know that FMG/C is considered a rite of passage in communities and because of this, we know that it will not end simply by passing a law. FGM/C will not end until communities collectively and publicly advocate for zero tolerance and work together to end its practice.” Ambassador Aslup said the advancement of women and girls is essential to peace, prosperity, and security, noting that they remain committed in their efforts to combat all forms of gender-based violence, including FGM/C while renewing the call for zero tolerance to end the harmful procedure that affects women and girls in far too many places across the globe. Musa Jallow from Gamcotrap said law is necessary but its effective implementation and enforcement and public awareness of the powers of the law is the most important. He added that enforcing the law that prohibits FGM is critical to legitimise local advocacy and educational efforts, to strengthen those who seek to defy social pressures of tradition and reject FGM to protect its victims and to end this event. Niccolo Figa Talamanca from No Peace Without Justice said the liberation of women is very essential and the mission that brought Gamcotrap into the fight is the same mission that brought his organisation. Female genital mutilation continues to hamper lives of women and girls. The US ambassador, Patricia Aslup said at least 200 million girls and women alive have under gone some form of FGM/C. She said the act is a grave and lifelong harm, it has been proven to cause to the physical and mental health of women and girls. She highlighted that if the current trends continue, many more millions of girls are at risk of being subjected to the practice by 2030. It is with this backdrop that GAMCOTRAP and its partners join the whole world to commemorate Zero tolerance to end female genital mutilation yesterday at the Friendship Hostel, in Bakau Stadium. He noted that the physical manifestation of women leaders in the struggle to end FGM cannot be estimated. He also calls for the enforcement of the law to protect women. He stated that collective measures are needed to protect the girl child, because it takes a lot of energy to protect women from harmful practices. Si è tenuto a Niamey dal 2 al 5 ottobre scorso il Forum delle Premieres Dames della CEDEAO che ha visto la partecipazione dei Ministri delle Donne e della Protezione dei Minori e della Salute dei 14 Paesi CEDEAO. La riunione a livello ministeriale del 4 ottobre ha portato all’adozione di tre documenti di cui due dichiarazioni delle Premieres Dames: 1) il quadro strategico per il rafforzamento dei sistemi nazionali per la protezione dei minori e per la prevenzione e risposta alle violenze, abusi e sfruttamento dei minori; 2) la dichiarazione sull’eradicazione della fistola ostetrica in Africa occidentale; 3) la dichiarazione sull’eliminazione della pratica delle mutilazioni genitali femminili e la lotta contro le violenze basate sul genere in Africa occidentale. Il Forum ha costituito un’occasione per riaffermare l’impegno a favore della realizzazione della VISION 2020 della CEDEAO che prevede, fra l‘altro, la costruzione di una CEDEAO dei popoli attraverso interventi mirati su donne e minori all’interno dello spazio comunitario. Al Forum è intervenuto S.E. l’Ambasciatore d’Italia a Niamey Marco Prencipe che ha pronunciato un discorso nella plenaria conclusiva del Forum del 5 ottobre al Palais des Congres di Niamey, momento di massima visibilità dell’evento, per via della presenza del Presidente della Repubblica del Niger, Mahamadou Issoufou, del Presidente della Repubblica del Togo, Faure Essozimna Gnassingbe, del Presidente dalla Commissione della CEDEAO, Marcel Alain De Souza, dei Ministri di Genere e Protezione dei Minori nonché dei ministri della Salute dei 14 paesi membri della CEDEAO, e delle Premieres Dames della CEDEAO. Nel suo discorso l’Ambasciatore ha evidenziato l’impegno dell’Italia nella campagna internazionale per l’eradicazione delle mutilazioni genitali femminili (MGF) sia nella fase di negoziazione (in particolare in seno alle Nazioni Unite e al Consiglio d’Europa) sia nella promozione di iniziative di sensibilizzazione e di progetti finanziati dalla nostra cooperazione allo sviluppo. Al Forum era presente anche il Segretario Generale Niccolo Figà-Talamanca di No Peace Without Justice (NPWJ) di cui il progetto BanGMF finanziato dalla DGCS/AICS e promosso dalla ONG nei paesi dell’Africa francofona con l’obiettivo di rafforzarne il quadro politico, istituzionale e giuridico di lotta contro le mutilazioni genitali femminili e di migliorare le politiche in materia di salute pubblica e riproduttiva, contribuendo all’eliminazione delle MGF attraverso l’implementazione della Risoluzione di messa al bando universale adottata dalle Nazioni Unite. The Coalition for the International Criminal Court would like to share in expressing our profound sadness at the passing of Professor M. Cherif Bassiouni. “Cherif was truly one of the world’s greatest experts of international law and justice. He was a true champion of the International Criminal Court and long-time supporter of the Coalition for the International Criminal Court,” said William R. Pace, Coalition Convenor. Cherif Bassiouni was a founding member of both the prestigious Siracusa International Institute for Criminal Justice and Human Rights (ISISC) and DePaul’s International Human Rights Law Institute. The liberation of Mosul from the Islamic State (IS) does not create an opportunity for most displaced Christians to return home, an Assyrian Christian in the United States advocating for the victims told Baptist Press (BP). Rather, many displaced Christians see better prospects in establishing their lives in the Nineveh Plains northeast of Mosul, said Juliana Taimoorazy, founder of the Iraqi Christian Relief Council. Based in Glenview, Ill., the council advocates for persecuted Iraqi and Middle Eastern Christians in their homelands and in the U.S.
IS displaced about 170,000 Christians inside Iraq, Taimoorazy estimates. Half of those were able to migrate to slums and refugee camps in cities such as Amman, Jordan, and in small villages in Turkey and surrounding areas of Beirut. Still others were tortured or killed, said Taimoorazy, who herself was harassed daily during her childhood in Iran under the Islamic regime, she said, and was smuggled to the U.S. as a teenager. The Minority Rights Group International, a London-based organization advocating for Iraqi Christians and similarly situated minorities in more than 60 countries, released a study in June conducted in cooperation with the Institute for International Law and Human Rights, No Peace Without Justice and the Unrepresented Nations and People Organization, all non-governmental organizations. Ci sono “buone battaglie” che vale sempre la pena di combattere. Una di queste è quella per l’abolizione delle mutilazioni genitali femminili, una pratica ancora molto diffusa in molti Paesi africani e che si conta secondo i dati dell’Unicef che ogni anno tocchi a tre milioni di bambine sotto i quindici anni. A combattere questa battaglia c’è anche l’associazione Non c’è pace senza giustizia fondata nel 1993 da Emma Bonino. Sono ormai 17 anni che l’ex commissaria europea e ministra degli esteri porta avanti questa campagna. Dal 2014 Non c’è pace senza giustizia guida un progetto in sette Paesi dell’Africa: Burkina Faso, Costa d’Avorio, Gambia, Guinea, Mauritania, Niger e Senegal. L’idea di questo lavoro - che si ispira alla risoluzione delle Nazioni Unite del dicembre 2012 che dichiara illegali le mutilazioni genitali femminili nel mondo è quella non di considerare queste pratiche barbare come una questione soprattutto medica ma di coinvolgere istituzioni, governi, comunità locali affinché si affrontino i pregiudizi culturali, religiosi e sessuali trovando le politiche migliori per impedire che questa forma di tortura continui ad essere impunemente praticata. Si tratta dell’incisione o addirittura asportazione, parziale o totale, dei genitali femminili esterni. Le bambine che la subiscono – e il fenomeno di mamme che vivono in Europa e rimandano le proprie figlie a casa per farne spose bambine e mutilate è preoccupante – dovranno poi fare i conti con danni irreversibili per la loro salute fisica e anche psicologica. Si stima che ad oggi ci siano 125 milioni di donne che hanno subito questa pratica, per lo più in Africa. Pratiche illegali, dolorosissime e pericolose per la salute della bambina e poi della donna con conseguenze al momento del parto, terribilmente umilianti per chi le subisce. Ora il progetto di Non c’è pace senza giustizia rischia di doversi fermare perché uno dei partner africani dell’operazione, di quelli che portano sul territorio il confronto, le informazioni alle donne e l’accoglienza per le vittime, non è più in grado di pagare il suo contributo che serve per finanziare conferenze, seminari e interventi locali nei sette Paesi africani. Mancano decine di migliaia di euro che porterebbero – come scrive Emma Bonino in una lettera in cui lancia l’allarme- «a pregiudicare in modo irreparabile venticinque anni di storia: questa somma serve a completare le attività della campagna che ha ricevuto anche un finanziamento della cooperazione italiana. Non realizzarle comporta la restituzione al donatore dell’importo non speso». In pratica la fine del progetto, che vale per il 2017 445 mila euro divisi negli interventi nei sette Paesi, proprio dopo la conferenza di Roma nel gennaio scorso aveva riconosciuto i progressi fatti dall’approccio sociale e politico che mira a far crescere la consapevolezza e a sfatare le falsità legate alla tradizione e alle credenze rispetto all’approccio soltanto medico o finanziario al problema della mutilazione genitale delle ragazze. Non è solo con un bonifico (eventualmente da intestare a Non c’è Pace Senza Giustizia, Banca di Credito Cooperativo di Roma c/c 2472, IBAN IT 24 E08327 03221 000000002472, BIC/SWIFT ROMAITRR) che si può cercare di evitare che il progetto si debba fermare. «Anche in Italia, in Europa – è l’appello di Emma Bonino - è necessario parlare e agire perché le donne immigrate non continuino questa pratica inumana contro le loro figlie». East of Mosul, many of the lands liberated from ISIS stand empty. Driving through the Nineveh plains, traditional homelands of Iraq’s minority communities of Yezidis, Christians, Shabak and Turkmen, you pass one ghost town after another, peopled only by members of the armed militias known in Iraq as the Hashd al-Shaabi, or ‘popular mobilisation’. Houses destroyed by ISIS vehicle bombs are juxtaposed with buildings flattened by international coalition air strikes. Inside the houses in many residential streets, there are holes smashed into the party walls to create the rat-runs used by insurgents to evade surveillance. The battle to retake Mosul is already nearly eight months old and, as resistance on the city’s right bank has proved intense, civilian casualties have mounted rapidly. Yet many of the empty territories in Nineveh east of the city and in Sinjar to the west were first retaken months ago. They join lands in Diyala, Kirkuk and Anbar where ISIS has been defeated but displaced people numbering in the millions have yet to return. To understand why is to appreciate the threats that now hang over the future of Iraq – threats that will not disappear when ISIS is defeated. The Iraqi central government in Baghdad and the Kurdistan Regional Government in Erbil are broadly in agreement that IDPs can only return once security and services are restored. They have a point. There is extensive destruction to essential infrastructure. When thousands of civilians first returned to Ramadi after it was retaken, there were dozens of reported serious casualties from booby-traps and other IEDs and explosive remnants of war. But many displaced minority communities now believe that their return is being delayed for other reasons. Christians, Yezidis, Shabak and Turkmen all cite cases where IDPs and supplies have been stopped at checkpoints, as detailed in a new report published by four international NGOs, Minority Rights Group International, the International Institute for Law and Human Rights, the Unrepresented Nations and Peoples Organisation and No Peace Without Justice. The fear is that land-grabbing is already underway. Brussels (AINA) -- The President of the Assyrian Confederation of Europe (ACE), Attiya Gamri, voiced strong concerns on the treatment of Assyrians and Yazidis by Kurdish military and political groups in northern Iraq during a conference in the European parliament on June 6. The Conference, titled Post-ISIS Nineveh: The European Response, was hosted by Ms. Ana Gomes and Mr. Elmar Brok, members of the European Parliament, organized by various entities, including the Institute for International Law and Human Rights (IILHR), the Multinational Development Policy Dialogue of Konrad-Adenauer-Stiftung, No Peace Without Justice (NPWJ), the Unrepresented Nations and People's Organization (UNPO), and Minority Rights Group International (MRG). Several important questions still remain six months into the the military operation to retake Mosul from ISIS, with the most important being the issue of the political, social and economic conditions for the sustainable return of those who lost homes and livelihoods as a result of the conflict. Speakers included Iraqi parliamentarians and civil society activists, MEPs, EU institutions and EU member states representatives. The president of the Assyrian Confederation of Europe asked EU-officials not to overlook the role of Kurdish political groups such as the peshmerga and the KDP political party of Kurdish leader Massoud Barzani in the difficulties facing Assyrians and Yazidis in the Nineveh Plain and Sinjar. "During my visits to the region Assyrians and Yazidis have whispered carefully in my ear of the oppression they face from Kurdish groups. I'm glad that as an European living in freedom I don't have to whisper and that I can be their voice in this chamber today", she said. The peshmerga has been accused of ethnic cleansing, arbitrary arrests and a range of other atrocities against non Kurds in reports from Amnesty, Human Rights Watch and other human rights organisations. The United States Commission on International Religious Freedom in its recent report on the Kurdish region paints a dark picture of the reality on the ground. L'attacco chimico che il 4 aprile ha colpito la cittadina siriana di Khan Sheikun, provocando la morte di decine di siriani tra cui 20 bambini, è solo l'ultimo episodio di un conflitto crudele che negli ultimi sei anni ha prodotto centinaia di migliaia di morti e milioni di rifugiati. In vista di importanti decisioni della Comunità Internazionale con Gianluca Eramo, direttore del Progamma Democrazia nella regione MENA di "Non c'è Pace Senza Giustizia", riteniamo che occorra porre con forza l'attenzione delle istituzioni su alcuni elementi imprescindibili per una soluzione del conflitto. Mentre il Consiglio di Sicurezza dell'ONU si riunisce d'urgenza per deliberare su una proposta di risoluzione presentata da Francia, Stati Uniti e Regno Unito - che condanna l'uso di armi chimiche in Siria e richiede una chiara individuazione delle responsabilità per questa ennesima violazione del diritto internazionale - i leader mondiali si riuniscono a Bruxelles per discutere possibili strategie per il futuro della Siria e della regione lungo tre linee guida generali: valutare il mantenimento degli impegni presi alla conferenza di Londra del febbraio 2016; ribadire gli impegni presi e incoraggiare un sostegno aggiuntivo per le persone in situazione di bisogno in Siria e nei paesi limitrofi insieme alle rispettive comunità ospitanti; evidenziare gli sforzi da parte della comunità internazionale per favorire un buon esito dei colloqui che coinvolgono membri di fazioni siriane sotto l'egida delle Nazioni Unite. Allo stesso tempo è previsto che la conferenza di Bruxelles cominci a considerare eventuali forme di "assistenza post-accordo", cioè investimenti necessari per la ricostruzione di un paese devastato da anni di violento e prolungato conflitto, che dovrebbero seguire il raggiungimento di un documento finale. La ricostruzione sarà chiaramente necessaria: la popolazione siriana è stata decimata e le sue infrastrutture devastate. Città intere sono in rovina, scuole distrutte, ospedali incapaci di funzionare, e tutti i servizi pubblici necessari a sostenere la vita quotidiana danneggiati in maniera gravissima. Questa distruzione rappresenta, naturalmente, anche una grave violazione delle leggi internazionali per la protezione dei diritti umani. Includere quanto sopra nell'agenda dei colloqui finalizzati a ottenere sostegno per le necessità di tipo umanitario e il negoziato tra siriani potrebbe equivalere a porre il carro di fronte ai buoi. Prima di tutto si anteporrebbe la ricostruzione al recupero, quasi a pensare prima ai mattoni che agli esseri umani - il popolo siriano non può più permettersi di accontentarsi di un posto in seconda fila mentre i suoi diritti e i suoi bisogni vengono discussi, sia ciò a causa degli interessi geopolitici o per la ricostruzione. Seconda di poi, si rischia che gli sforzi per la ricostruzione subiscano la stessa sorte dell'aiuto umanitario – al momento sotto attacco e negato in quanto mezzo per controllare la popolazione e costringere la gente a spostarsi e alimentare la guerra. Intervista a Niccolò Figà Talamanca (segretario generale dell'Associazione Non c'è Pace senza Giustizia) realizzata da Sonia Martina. Siria, la costruzione della democrazia – Un gruppo di attivisti di diversi movimenti sociali siriani sono a Roma per due giorni per incontrare la società civile e le istituzioni italiane. I lavori sono stati organizzati da Un ponte per… insieme a No Peace Without Justice e alla Iraqi Civil Society Solidarity Initiative, che condividono l’impegno degli attivisti siriani nella difesa dei diritti umani. La società civile locale dal 2011 ad oggi ha resistito al peso della guerra e si è organizzata per fornire servizi, soccorrere le vittime, educare alla pace, esercitare la democrazia. Sentiamo Mazen Darwish del Syrian Centre for Media and Freedom of Expression, nell’intervista di Federica Margaritora. It’s President Rodrigo Duterte, not Vice President Leni Robredo, who is upsetting the international community for his inducement of extrajudicial killings, according to a United Nations affiliate organization to which Robredo sent a video message criticizing Mr. Duterte’s war on drugs. Speaking for the first time about the firestorm sparked by Robredo’s message to the UN Commission on Narcotic Drugs annual meeting in Vienna on March 16, David Borden, executive director of the UN-accredited Drug Reform Coordination Network, said the Vice President deserved no blame for shining a spotlight on Mr. Duterte’s bloody war on drugs. In an e-mail correspondence with the Inquirer, Borden said it was Duterte himself who had diverted global attention to the Philippine human rights situation as a result of his strongman policy and rhetoric against drug pushers and users. The Inquirer sought Borden and the other leaders of UN-affiliated groups who participated in the Vienna forum for comment on the political fallout that followed Robredo’s message. “I did not hear anything in the Vice President’s speech that sounded like a betrayal of the public trust,” said Alison Smith, legal counsel and director for the International Criminal Justice Program of the UN-affiliated No Peace Without Justice. “To the contrary, she appeared to be acting in the best interests of the public, and of the country as a whole, in appealing for a response to the drug problem based on human rights and the rule of law,” said Smith, who also took part in the Vienna meeting. Smith said two main points emerged from the forum: “One is that the way to treat a drug problem is through treatment and rehabilitation. Reducing demand can go a long way to address supply and can also help former drug users become productive members of society.” “The other important point was a sense of fear that in a situation such as we face today with a global rise in populist and authoritarian or authoritarian-leaning leaders, those leaders might adopt a similarly violent approach to drug problems in their own countries,” she said. Quest’anno l’8 marzo nelle Filippine è stato festeggiato nel segno del NO alla guerra alla droga. Il Vice Presidente della Repubblica Leni Robredo e la Senatrice Risa Hontiveros hanno reso omaggio alla detenuta più famosa del paese: Leila de Lima. Arrestata il 23 febbraio 2017 con l’accusa di narco-traffico, la Senatrice De Lima, se riconosciuta colpevole, rischia da 12 anni all’ergastolo. Da quando Rodrigo Duterte è stato proclamato Presidente della Repubblica il 30 giugno dell’anno scorso, nelle Filippine è in corso una massiccia campagna di esecuzioni extragiudiziali in nome della “guerra alla droga” con intimidazioni e minacce sistematiche contro chiunque avanzi critiche. Fonti pubbliche dicono che dall’estate scorsa oltre 7000 persone, tra “spacciatori” e “drogati”, sono state uccise o trovate morte in circostanze da chiarire senza che le autorità nazionali abbiano aperto indagini ufficiali. Allo stesso tempo centinaia di migliaia di persone si sono consegnate “spontaneamente” alle autorità per paura di cadere vittime della campagna di violenza istituzionale che ha aggravato la già drammatica situazione dell’amministrazione della giustizia di quel paese e delle condizioni delle sue carceri. Dall’inizio dell’anno la società civile filippina ha iniziato a reagire alle prepotenze presidenziali, in pochi giorni decine di manifestazioni sono state organizzate contro le violenze di Duterte tanto che il Presidente ha fatto richiamare in servizio 160mila agenti della Polizia Nazionale che a fine gennaio erano stati sospesi temporaneamente perché implicati in un enorme giro di corruzione. Anche la Conferenza episcopale filippina – organismo rilevante in un paese in cui oltre l’80% è di confessione cattolica – si è unita nelle critiche senza però far recedere il Presidente dalle sue azioni. Nell’agosto dell’anno scorso, Leila De Lima aveva denunciato le responsabilità istituzionali delle uccisioni di massa occorse già una decina di anni fa, a seguito di indagini indipendenti. Erano indagini svolte nella città di Davao dove Duterte era sindaco e ras indiscusso. Dall’estate del 2016 il presidente filippino ha accusato la senatrice d’aver fatto entrare droga all’interno di uno dei più grandi carceri del paese quando ella era Ministra della giustizia. La campagna diffamatoria presidenziale ha portato il Presidente del Senato a rimuovere la De Lima dalla presidenza della commissione diritti umani con l’accusa di voler “distruggere il Presidente”. Da allora gli alleati del Presidente in Parlamento hanno confermato le accuse di Duterte nei confronti della loro collega. Il 17 febbraio scorso il Dipartimento di Giustizia ha rincarato la dose accusandola di vero e proprio narco-traffico. La settimana scorsa Radicali italiani, Non c’è pace senza giustizia e l’Associazione Luca Coscioni hanno scritto a tutti i parlamentari italiani per chiedere l’immediata liberazione della senatrice De Lima e la fine delle uccisioni di massa nelle Filippine. In questi giorni è in corso a Vienna la riunione della Commissione ONU sulle Droghe e il 16, la Fondazione DRCNet e l’Internazionale liberale e altre associazioni asiatiche illustreranno il caso filippino anche nel quadro dell’attivazione della giurisdizione della Corte Penale Internazionale per crimini contro l’umanità. Tra i presenti Jose Luis Martin “Chito” Guascon, Presidente Commissione sui diritti umani, Repubblica delle Filippine; Lousewies van der Laan ,ex leader degli olandesi D66; Maria Leonor “Leni” Girona Robredo, Vice Presidente delle Filippine; Alison Smith, di Non c’è Pace Senza Giustizia; Abhisit Vejjajiva Presidente dei Liberali e dei Democratici asiatici, ex primo ministro della Thailandia oltre David Borden, direttore esecutivo della DRCNet Foundation e chi scrive. Lo scorso 23 febbraio la signora Leila de Lima è stata arrestata a Manila, nelle Filippine, accusata di corruzione e narcotraffico, diventando la più famosa detenuta del Paese, in patria e all'estero. Leila de Lima è una senatrice del Parlamento della Repubblica delle Filippine, già Ministro della Giustizia con il precedente governo, e negli ultimi mesi si è distinta per essere un'accanita oppositrice al presidente Rodrigo Duterte, criticandolo fortemente e accusandolo di responsabilità dirette nelle esecuzioni extragiudiziali di “spacciatori” e “drogati”: oltre 7.000 cadaveri dal 1 luglio ad oggi, secondo i numeri snocciolati dallo stesso governo filippino (la vice-presidente Robredo ha di recente corretto il numero parlando di 8.000 morti). Leila de Lima è il primo prigioniero politico della presidenza di Rodrigo Duterte ma non è l'unica a temere per la propria incolumità: il senatore Antonio Trillanes IV ha dichiarato di recente che “Duterte mi vuole morto”. Il proibizionismo nelle Filippine “si conferma come una potente e mortale museruola. Chi è contro la guerra alla droga è un nemico della sicurezza del popolo e, se non direttamente coinvolto o comunque coinvolgibile nel traffico, deve esser sequestrato fisicamente per zittire ogni voce critica” ha dichiarato a IBTimes Italia Marco Perduca dell'Associazione Luca Coscioni, ed ex-senatore Radicale, che partecipa proprio in questi giorni alla 60° Conferenza ONU sulle Droghe di Vienna. In verità la guerra alla droga di Duterte, che indigna mezzo mondo, sta incrinando gli equilibri politici anche all'interno delle Filippine: alla riunione della Commissione ONU di Vienna è intervenuta anche la vice-presidente delle Filippine Leni Robredo, che ha sorprendentemente criticato le priorità del presidente Duterte in materia di guerra alla droga: “È un problema complesso che non si risolve solo con le pallottole e deve essere considerato per ciò che è veramente: un complesso problema di salute pubblica legato a povertà e disuguaglianze sociali”, ha dichiarato in un video (…) trasmesso il 13 marzo durante un incontro organizzato dall'Associazione Luca Coscioni a margine della Conferenza ONU, con il sostegno dell'Internazionale liberale e della Drug Policy Alliance, oltre che in collaborazione con la DRCNet Foundation. Ieri (15 marzo) diversi senatori e deputati italiani hanno rilanciato un appello, #FreeLeila, lanciato proprio dall'Associazione Luca Coscioni, da Radicali Italiani e da Non C'è Pace Senza Giustizia affinché la senatrice filippina Leila de Lima venga scarcerata. Una battaglia sempre più aspra e sempre più ampia condotta dentro e fuori dell'arcipelago delle Filippine, che sopperisce oggi ciò che la comunità internazionale non riesce a fare: cercare di fermare i crimini di Duterte contro il suo stesso popolo. Si e’ svolto oggi a Dar es Salaam, in Tanzania, il seminario “Working to End Female Genital Mutilation”per una analisi delle sfide e i progressi realizzati dalla Tanzania sul fronte della lotta alle mutilazioni genitali femminili (Mgf), alla luce della recente conferenza di Roma “BanFGM” promossa dall’associazione “Non c’è pace senza giustizia” con il sostegno politico e finanziario del Ministero degli Esteri e dell’Agenzia per la Cooperazione (Aics). Il seminario ha visto la partecipazione della Presidente del Parlamento tanzaniano, Tulia Ackson, e del Segretario Generale del Ministero della Sanità, rispettivamente in qualità di ospite d’onore e di moderatore del seminario, presenti rappresentanti della società civile, delle Agenzie Onu e delle istituzioni pubbliche. Il seminario ha offerto anche l’occasione per mettere in luce l’impegno di dell’Italia a favore della salvaguardia e promozione dei diritti umani e dell’importanza fondamentale annessa dal Paese alle iniziative a tutela della donna da ogni forma di violenza e discriminazione, favorendo anche a livello internazionale azioni positive volte ad affermarne il ruolo nella società su un piano di parità di genere. Si svolge oggi a Dar es Salaam, in Tanzania, il seminario “Working to end female genital mutilation”, che intende analizzare le sfide e i progressi realizzati dalla Tanzania sul fronte della lotta alle mutilazioni genitali femminili (Mgf), alla luce della recente conferenza di Roma “BanFgm” promossa dall’associazione “Non c’è pace senza giustizia” con il sostegno politico e finanziario della Farnesina e dell’Agenzia italiana per la Cooperazione allo sviluppo (Aics). Il seminario, come riferisce una nota della sede Aics di Nairobi, vedrà la partecipazione della presidente del parlamento tanzaniano, Tulia Ackson, e del segretario generale del ministero della Sanità, rispettivamente in qualità di ospite d’onore e di moderatore del seminario, che vedrà inoltre la presenza di rappresentanti della società civile, delle agenzie Onu e delle istituzioni pubbliche. (segue) (Com) © Agenzia Nova - Riproduzione riservata. On 22 February 2017, the judges of the North Gauteng (Pretoria) high court judges unanimously ruled that the South African government jumped the gun by notifying the UN of its intention to withdraw from the ICC without first obtaining parliamentary approval, and ordered President Zuma to revoke the 2016 notification. “The absence of a (specific) provision in the Constitution for the executive to terminate any international agreement is confirmation of the fact that such power does not exist until Parliament legislates for it,” said Judge Phineas Mojapelo in delivering the unanimous judgment. He also called the withdrawal "hasty, irrational and unconstitutional." 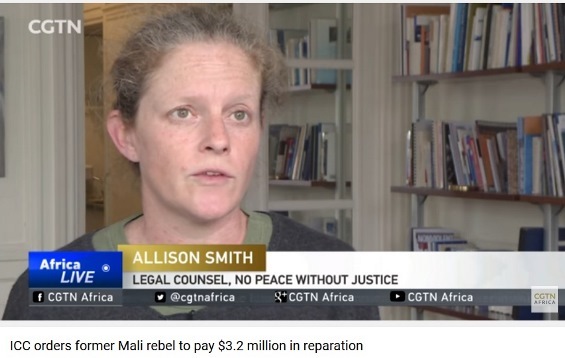 The judgment stems from an executive action by the South African government last October by which it notified the UN Secretary-General – the depositary of the Rome Statute, the ICC founding treaty – of its intention to withdraw from the ICC. 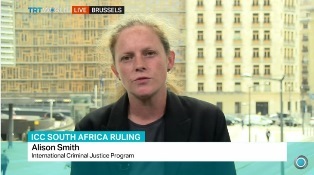 “We hope today’s decision gives time for cooler heads in South Africa’s Government to prevail and decide not to present a withdrawal Bill to Parliament”, Smith added. “If that happens, however, we hope that South Africa’s Parliament will stand on the side of victims and the protection of human rights on which today’s South Africa was built. In the meanwhile, we urge all States Parties to continue to reiterate in no uncertain terms their commitment to the integrity and the principles underpinning the Rome ICC Statute and their absolute commitment to ensuring justice and redress for victims of the world’s worst crimes, wherever they may take place."